Oblivious to the treasure I had, I placed the bowl on the kitchen table and filled it with old plastic vegetables. When my wife and I began dating, we discovered both of us loved old things. Her passion was carnival glass, something I’d never heard of and knew nothing about. 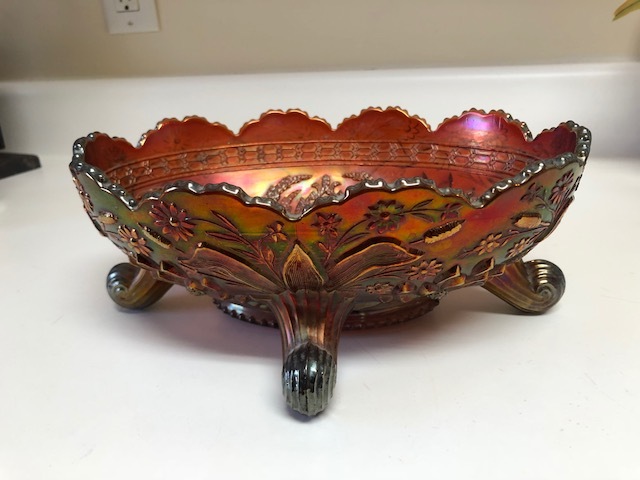 We removed the old vegetables and cleaned up the bowl that had belonged to my great grandmother’s mother. There were no markings, so we decided to take it to an antique dealer friend and see what they could find out. Imagine our surprise when we were told it was an early piece of Fenton worth several hundred dollars. Needless to say, we didn’t return it to the table and fill it with plastic vegetables. We proudly displayed it in a safe and noticeable place where its true beauty could shine. Paul says believers are masterpieces even though I sometimes don’t feel or act like one. But my feelings and actions don’t change the facts. God sees the finished work; I see the work in progress. And a painting in process often looks ugly or like nothing at all. While I may not appear as much to others, God sees me as extremely valuable. So valuable that He let His Son die for my sins instead of making me pay for them. And although I make many mistakes and foibles along the way, with God anything is possible. He has the power to form me into what He wants me to be. All I must do is cooperate and seek His wisdom and guidance. Having had the blood of Christ applied to my life, I am worth more than others might think and more than I could ever imagine—but only because I am in Christ and have been created by a loving God. Although sin mars the masterpiece God is painting, the forgiveness of Christ restores its beauty. Others may say you are nothing, but God says you are something. He wants to take all the clutter away, wash you up, and display you as His. A beautiful work of art. In God’s eyes, you are of inestimable value. Live as God sees you. Tweetable: Do you know you are of inestimable value? Prayer: Father, may we live out in action, attitudes, and words the people we truly are.